Gather up your girls and get dolled up with a dress designed for endless twirling! 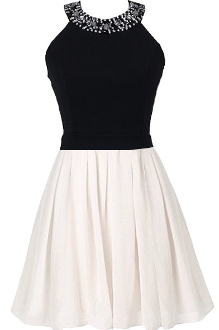 Features a beautiful rhinestone-embellished neckline, bold black top with pretty fitted waist, adorable bow decorating the backside, and a white skater-style skirt to finish. Pair with a white cardigan and kitten heels to complete the look! Color: Black + White. Shell: 96% Polyester, 4% Spandex. Lining: 100% Polyester. Hand wash recommended. Made in the U.S.A. Measures 34.5" from shoulder to hem. Click here to see this dress on a model!